This One Pan Mexican Quinoa is a total flavor-packed weeknight winner. It’s spicy, smoky, satisfying and it only takes 20 minutes on the stove. I’ve been on a spicy food kick ever since I posted my Creamy Chipotle Sauce this week. I had some extra chipotles in adobo sauce leftover, so I decided to put them to good use for this One Pan Mexican Quinoa recipe. I adapted this spicy goodness from my Santa Fe Quinoa Stuffed Peppers but I got the all-in-one inspiration from this recipe by Jessica Gavin. I love the idea of cooking the quinoa with the veggies, beans, and seasonings. Makes things even easier for weeknight meals. So, basically, this is a glorious pan of deconstructed stuffed peppers. The only thing different flavor-wise is that the peppers aren’t roasted. But, the smoky chipotle peppers in adobo sauce make up for it. 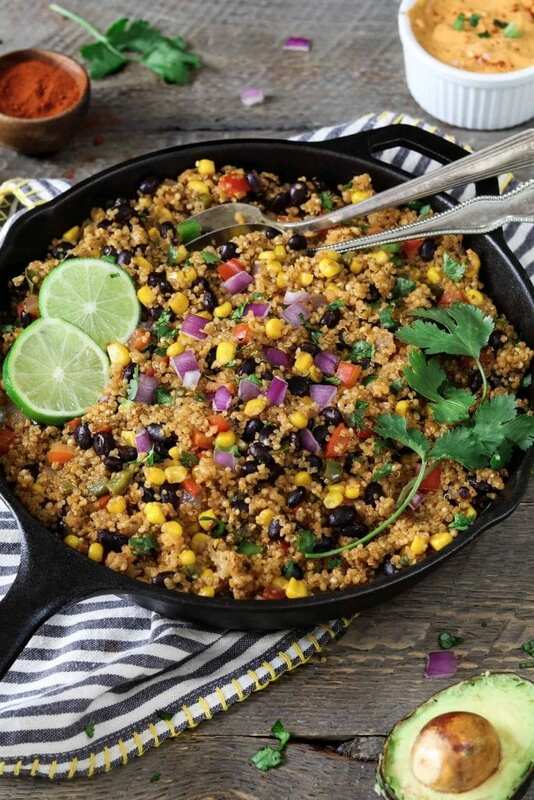 WHAT DO I NEED TO MAKE ONE PAN MEXICAN QUINOA? You might need to take a trip to your local grocery store, but you can definitely find everything you need in one place. The ingredients are easy-to-find, inexpensive and good for you. 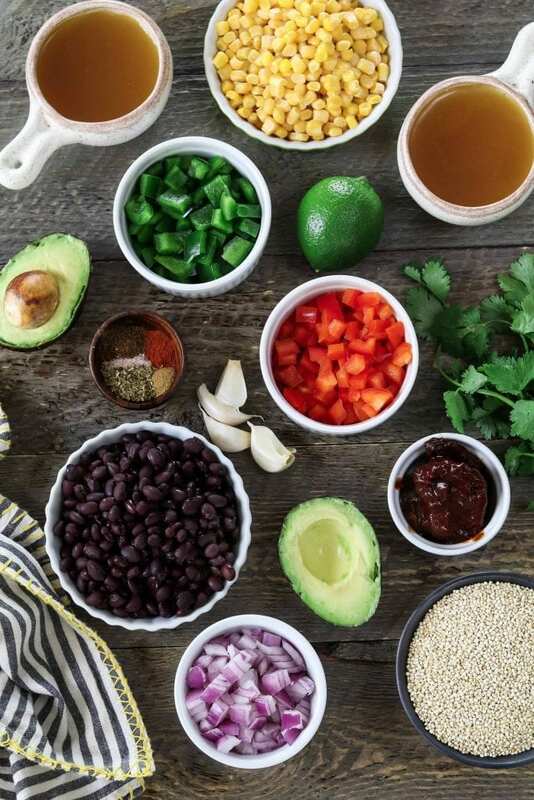 You’ll need grapeseed oil, red onion, green bell pepper, red bell pepper, garlic, chipotle peppers in adobo sauce, chili powder, oregano, cumin, smoked paprika, sea salt, quinoa, vegetable broth, corn kernels, black beans, lime juice, and cilantro. * Be careful with the chipotle peppers. You want to wash your hands thoroughly after and avoid touching your eyes. You can wear gloves too. If you don’t want to touch them at all, you can pop the whole peppers with sauce in the blender to turn into a purée (you can leave seeds inside). CAN I MAKE THIS KID-FRIENDLY? YES! For a kid-friendly version, scale down the cumin and chili powder and replace the adobo peppers with 1-2 tablespoons of tomato paste or 1 medium diced tomato. 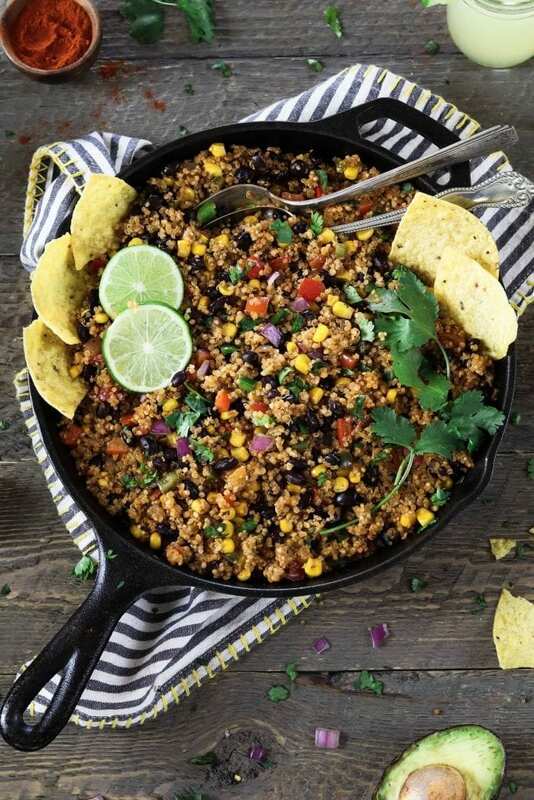 Grab your skillet, along with a Margarita because this meal is fun and easy to make. Once you chop up the onions and peppers, you’ll be ready to go. Heat the oil in a large skillet over medium heat. Now add the diced onion and sauté until translucent for about 2-3 minutes. Add the diced bell peppers and sauté until somewhat softened for about 5-6 minutes. Now add the minced garlic, chopped chipotle peppers, adobo sauce, and all seasonings (except the salt). Sauté for 1 minute and watch carefully to prevent burning. Add the rinsed quinoa, vegetable broth, black beans, corn, and salt. Stir to combine well. Cover pan and raise heat to bring to a boil. Once boiling, reduce heat to maintain a low/medium simmer (*If the heat is too high, the broth will evaporate too fast). Cook until liquid is gone and quinoa is soft and fluffy. This should take about 15-20 minutes. Remove pan from the heat and fluff quinoa with a fork. Add chopped cilantro and squeeze in the lime. Taste for seasoning and add more if needed. Add fresh-cracked pepper if desired. Optional serving ideas: vegan sour cream, avocado slices, guacamole, salsa, hot sauce, tortilla chips. This is a meal all on its own, but you can also use it as a filling for wraps, tacos, burritos, stuffed peppers, salads and more. It also works nicely on the side of a main meal. I love it with my Tou Scramble. 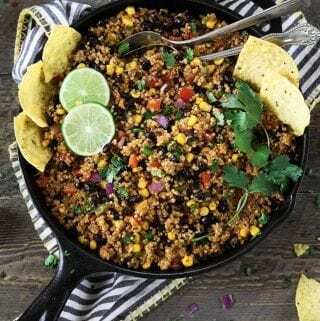 If you make this One Pan Mexican Quinoa, let me know what you think by ★ star rating it and leaving a comment below. It would really make my day. You can also follow me on Instagram and share your creation with me. Just tag me @veganhuggs and hashtag #veganhuggs so I don’t miss it. This One Pan Mexican Quinoa is a total flavor-packed weeknight winner. It's spicy, smoky, satisfying and it only takes 20 minutes on the stove. Heat oil in a large skillet, over medium heat. Add onion and sauté until translucent, about 2-3 minutes. Add bell peppers and sauté until somewhat softened, about 5-6 minutes. Add garlic, chipotle peppers, adobo sauce, and all seasonings (except salt). Sauté for 1 minute. Watch carefully to prevent burning. Now add quinoa, broth, black beans, corn, and salt. Stir to combine. Cover pan and raise heat to bring to a boil. Once boiling, reduce heat to maintain a low/medium simmer. (*If the heat is too high, the broth will evaporate too fast). Cook until liquid is gone and quinoa is soft and fluffy. About 15-20 minutes. Remove from heat and fluff with a fork. Add chopped cilantro and squeeze in the lime. Taste for seasoning and add more if needed. Add fresh-cracked pepper if desired. See notes for topping ideas. Be careful with the chipotle peppers. You want to wash your hands thoroughly after and avoid touching your eyes. You can wear gloves too. If you don't want to touch them at all, you can pop the whole peppers with sauce in the blender to turn into a purée (you can leave seeds inside). 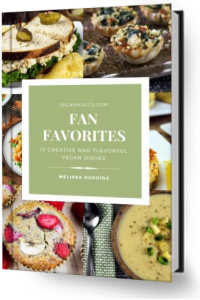 Topping ideas: vegan sour cream, sliced avocado, guacamole, salsa, hot sauce, or creamy chipotle sauce. Serving ideas: serve as a meal or a side. Goes great with tortilla chips, inside wraps, tacos, burritos, salads and more. For a kid-friendly version, scale down the cumin and chili powder. Replace the adobo peppers with 1-2 tablespoons of tomato paste or 1 medium diced tomato. * Adapted from my Santa Fe Quinoa Stuffed Peppers. Inspired by this recipe by Jessica Gavin. This is so good! I brought it to work with corn tortillas and all the taco toppings. Everyone loved it. Two asked for the recipe! I’m sorry, 11/2 cups of quinoa? And 11/2 tea spoon chilly power?